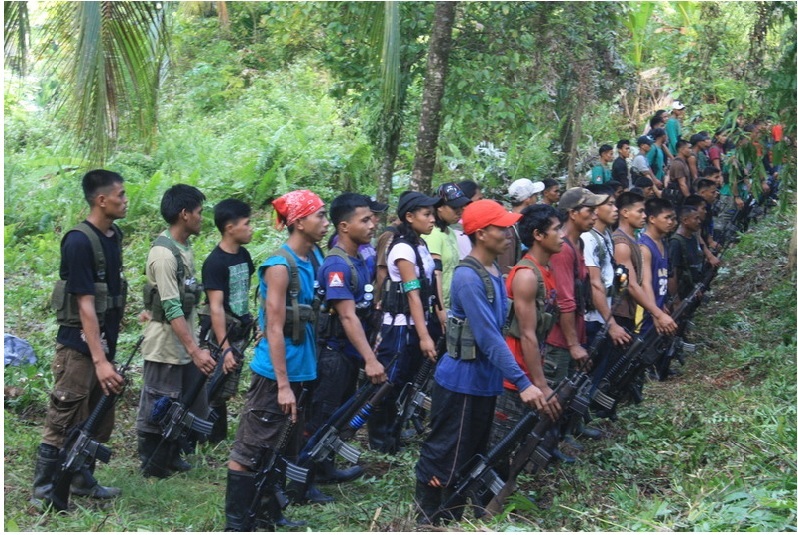 NPA fighters perform drills in this undated photo. Taken from the official CPP-NPA website. Election period in the country usually draws out the heinous and sinister sides of Filipinos. Politicians desperate to win go an extra mile in asserting their competitiveness. The most appalling atrocities this country has seen usually happened in the lead-up to national polls: the Maguindanao massacre being the most prominent example with the Plaza Miranda bombings at a close second. In some cases, the election period is seen as a window of opportunity for some to generate added revenue. In talking about revenue, the big winners are usually the TV stations and radio companies who earn advertisement income. But in the most far-flung and crime-laden areas of the nation a less legitimate organization benefit from the money exchange: lawless elements who thrive in the extortion business. In the early morning of May 27, a landmine stunned a convoy of elite policemen belonging to the PNP-Special Action Force in the province of Cagayan. Soon after, a contingent of 30 New People’s Army (NPA) rebels fired upon on the survivors, outgunning and outnumbering them. When the dust settled, the rebels had shot 15 of the police personnel with eight of them fatalities. The NPA had also ransacked 11 high-powered rifles and seven handguns from the bodies of the dead. The policemen were on their way to a hospital when their truck triggered a landmine planted in the middle of the road. This attack came just two days after seven Philippine Marines were killed in an ambush by over 50 Abu Sayaff terrorists in Jolo, Sulu. It is astonishing to think that nearly four decades since its’ formation the New People’s Army still lurks in our jungles, thriving in rural communities that center their life on agriculture. They present themselves to be freedom fighters, waging a war they claim to be that of the working class’. While their intentions are noble and revolutionary, the manner in which they conduct their doctrine borders on criminal and has led them to be tagged ‘terrorists’. These NPA fighters proclaim themselves to free the lives of the common Filipino from the corruption and oppression done by the government, but in doing so they are imposing their own oppression and restrictions on these citizens. 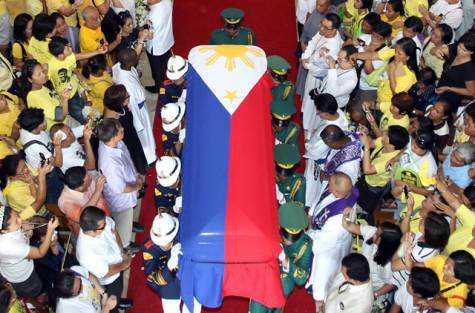 A flag draped coffin of a slain combat soldier is laid to rest in this photo. The formation of the group came as a result of the Japanese occupation during the second World War, when fleeing Filipino soldiers who survived the battle in the cities regrouped in jungles and formed the Hukbong Bayan Laban sa Hapon (HukBaLaHap or simply – the Huks), translated as Forces of the Country Against the Japanese. The defeat of the Imperial forces rendered the purpose of the group useless, yet even when the bulk of their force returned to peace a minority carried on fighting with their cause spurred by the ideologies of Socialism during the Cold War. The force garnered a renewed strength during the Marcos era when the atrocities committed by Marcos-loyal troops enraged nationalists to take up arms. But today, the Japanese have fled and Marcos is dead. What purpose do the Huks, now called the NPAs, serve? At an era during the 20th century when Socialism was gaining popularity their existence may be justifiable, but with the Communist model firmly proven to be inefficient would these terrorists dare say there is a reason for the nation to raise the red flag? Every head-of-state that succeeded the Marcos regime, five in fact: the late Corazon Aquino, Fidel Ramos, Joseph Estrada, Gloria Arroyo and Noy Aquino, have made a promise for a lasting peace in the country a part of their platform. Yet today, the communists still limit the development of rural cities and spread terror among citizens and business owners. Even the forces assigned to accost these terrorists are being pushed around themselves. The sad fate of the policemen who perished in last month’s attacks was not an isolated incident. In the lead-up to the May 13 elections a string of NPA-led violence marred the otherwise peaceful election period , a rare feat for the country. The most significant would perhaps be the ambush on the convoy a high-profile candidate, Ruth de Lara Guingona, a mayor and wife of a former Vice President. On her way home from her town’s fiesta, a brigade of NPAs ambushed her convoy and killed two of her bodyguards. Mayor Guingona suffered several injuries as a result of the attack, which the NPA said was caused by the mayor’s failure to pay taxes to the movement. It is sad to note that these lawless elements have the audacity to impose their own rules and tariffs on Filipino citizens, politicians as a matter of fact. These ‘revolutionary taxes’ are the source of the movement’s funds which they use to rearm and strengthen their cause. What’s even more terrifying is that they are able to carry-out penalties if their rules are broken, hence in the attack on Mayor Ruth’s entourage. Soldiers in the frontlines are ill-equipped and are very vulnerable to attacks. Just a few weeks after, two more separate attacks happened in the Luzon region. On the morning of 9th May, soldiers of the 17th Infantry Battalion delivering automated election machines to Lubuagan town in Kalinga province were ambushed a band of NPA terrorists. 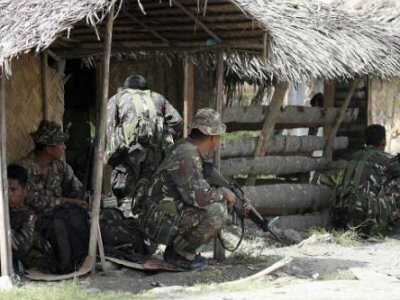 Two soldiers were killed and five more wounded during the firefight. Thousands of kilometers apart, one AFP militia personnel was killed in another attack on authorities delivering automated election machines in Camarines Sur. These spate of attacks dented the election process of the nation, they compromised the polling machines that would have been used to cast votes. To make it even worse, the soldiers who are tasked to defend the election process were helpless against the NPA during these attacks. Ever elected leader makes it a point to mention strengthening the country’s armed forces to protect the peace, yet barely anything happens. Gloria Macapagal-Arroyo made a bold promise to eradicate the communists before she stepped down in 2010, it’s three years after and the rebels are the ones gaining the upper hand on the government. The incumbent Benigno Aquino is making the most concrete effort in years to beef up the country’s military hardware, with the delivery of three frigates completed as well as the completion of the purchase of eight modern attack helicopters. But this was done as a result of the threat of an even bigger communist, the People’s Republic of China, lurking in our territories putting up structures on islands the country has sovereignty over. Aquino makes an even bolder statement: to defend the territory at all costs. The reason that statement is an even more noble one than Arroyo’s is because if we could hardly deal with our own communist threats, its almost farcical to believe we stand a chance against a giant like China. Words are often assuring, but inaction makes them unsubstantial, in fact, useless. Presidents who have realized the lack of funds and proper training make it difficult to attain a military victory often turn to a peace treaty; diplomacy should always be the main course of action, but the problem with extending diplomacy to these terrorists is that they are only interested when their fronts have been weakened. After experiencing a high number of casualties or a lack of funds, the NPA turn to a peace process to introduce a cease-fire, allowing them to regroup, retrain and rearm. When this process is complete, they turn on their word and resume warfare. It is a tactic that has been reused throughout decades and is key to the organization’s survival. It is often best to avoid bloodshed and to turn to a peaceful solution, such as the case with the Moro National Liberation Front (MNLF) rebels who forged a lasting peace agreement with the government. But looking back at the history of the country’s war with the NPA, it has been going on for four decades and have lost so many lives. These terrorists are not asking for ancestral domain ownership but political control over the entire country. That objective is not reasonable and what the NPA are asking is not feasible either, therefore peace with the Communists should not be negotiable. While countless of lives may be lost if the military pursues these Reds in an agressive campaign, more lives will be lost and prosperity will never be met if the country does not find a solution to this problem immediately. We need to weigh in the losses and make a decision. Hearing of stories of lawless elements such as the NPA run amock in rural towns and wreak havoc on civilians and businesses is enough for us to see red. It is heartbreaking when we hear that the faction who could stop them, the Armed Forces of the Philippines, are being pushed around themselves. The nation needs to act fast, more flag-draped coffins will meet weeping relatives if the NPA kept having things their way.